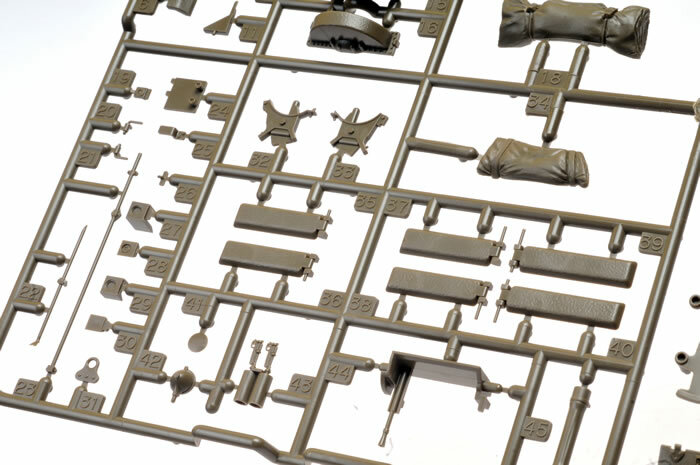 Media and Contents: 580 parts in dark green plastic (320 of these are the track links and skids), ten polythene caps and markings for two vehicles. 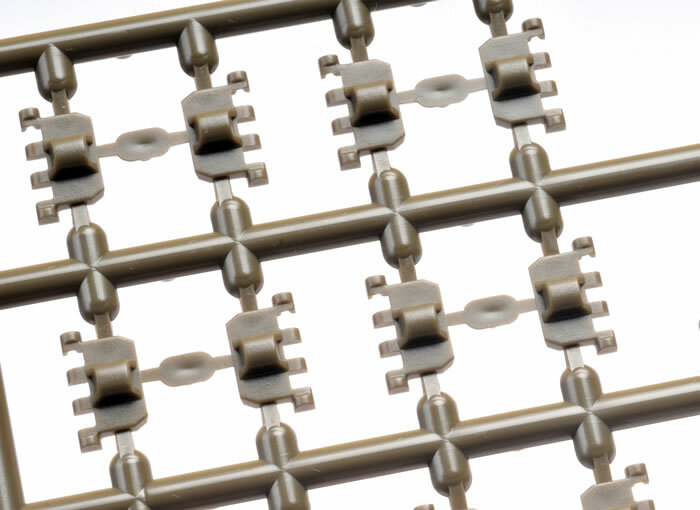 Advantages: Excellent detail; convincing surface textures; fully workable click-together individual track links; includes two crew figures. 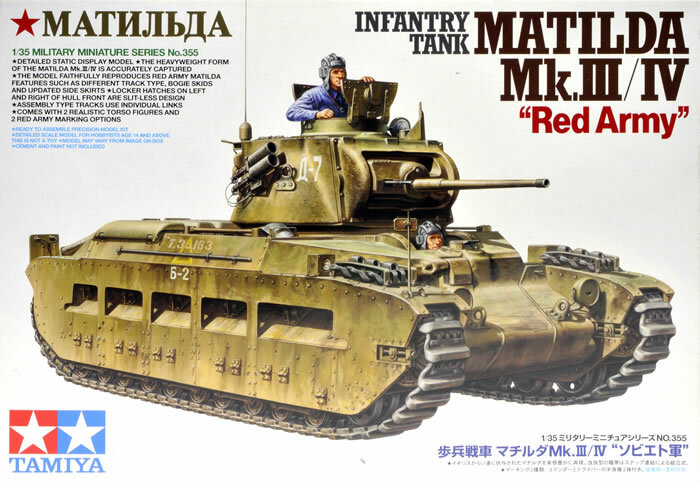 We have just have received an early production sample of Tamiya’s forthcoming “Red Army” Matilda. 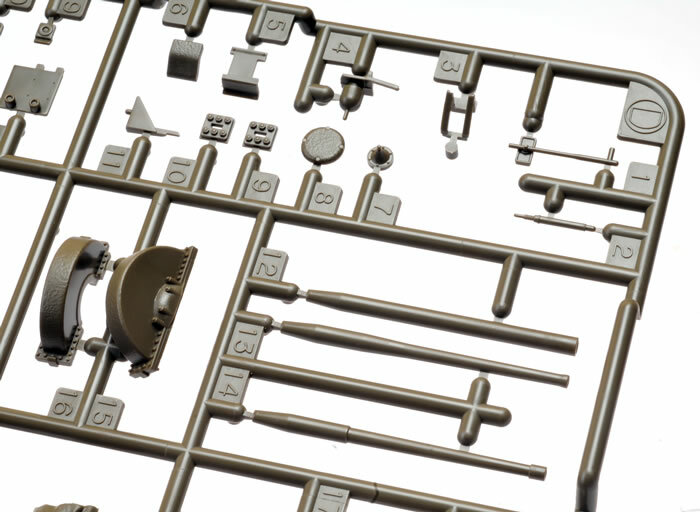 This model is based on the new-tool kit from 2009 (Kit No. 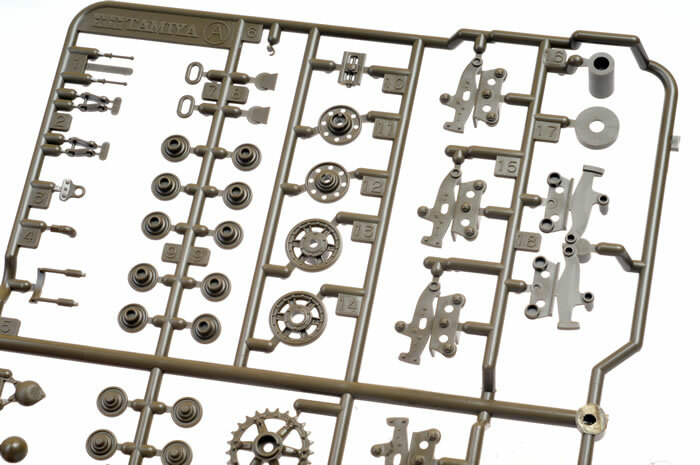 35300) and shares absolutely nothing in common with Tamiya’s original Matilda, kit number 35024, that was released in 1973. 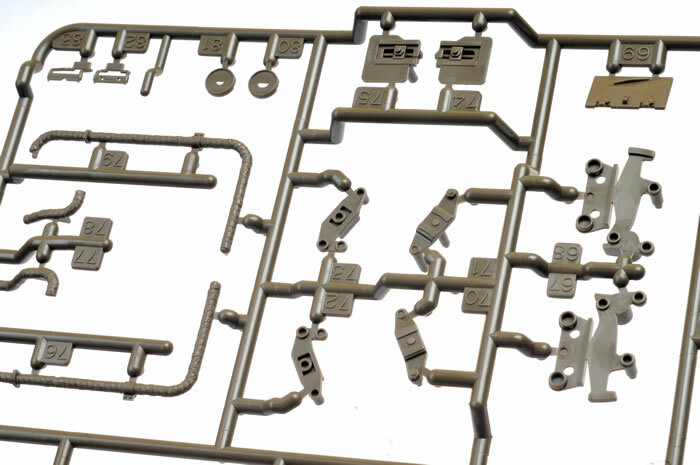 Tamiya’s new “Red Army” Matilda comprises 580 parts in dark green plastic (320 of these are the track links and skids), ten polythene caps and markings for two vehicles. So what is different in this version? Quite a lot, as it turns out. 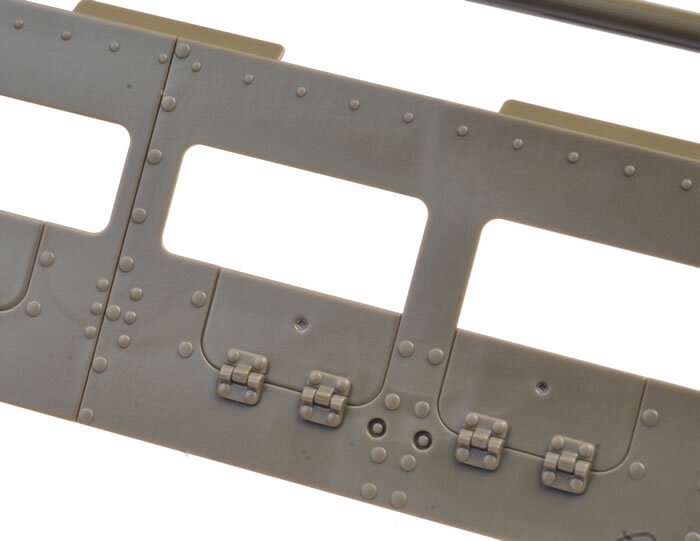 There are new side skirts with characteristically prominent hinges for the mud chute hatches. Track skids replace the return rollers of the previous kit. New solid front locker hatches are also included. This offers a pretty good representation considering the guide teeth are almost completely hidden behind the complex running gear and large armoured side covers. 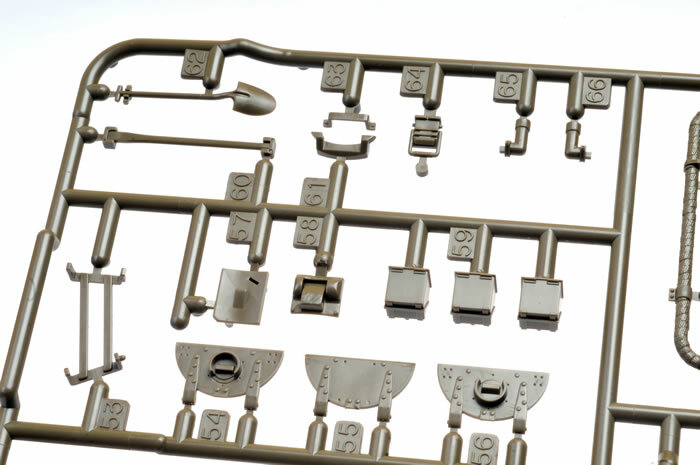 Surface texture is everything we have come to expect from a new Tamiya release. 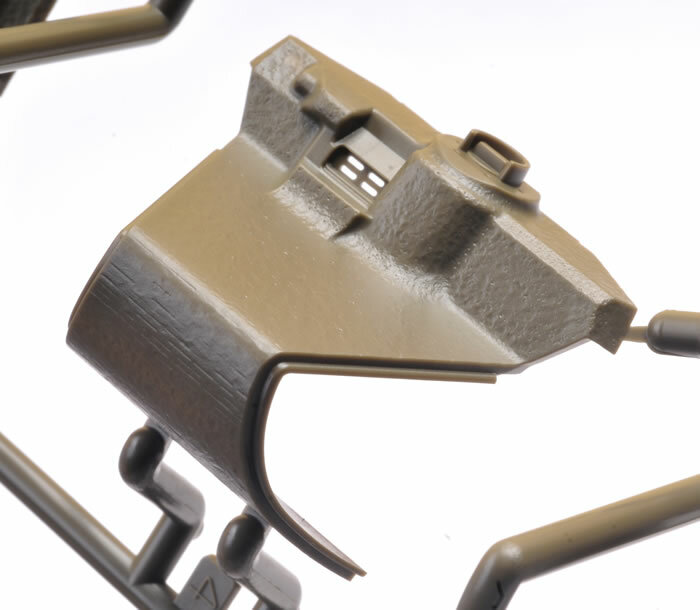 Cast metal is beautifully depicted on the turret, the nose and the armoured engine deck covers. 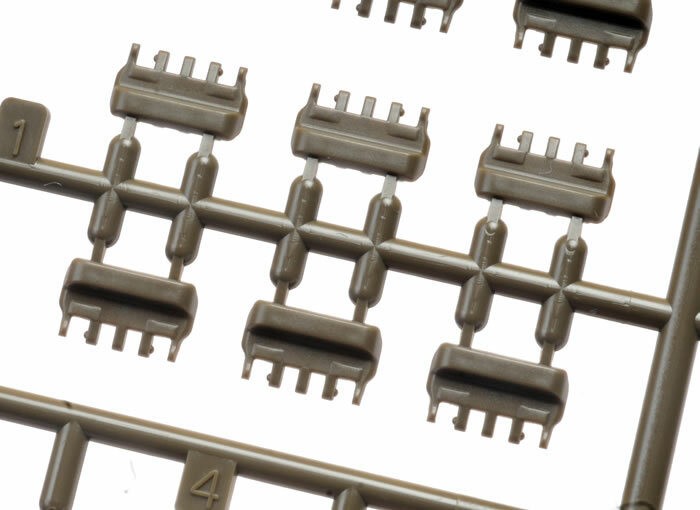 Recessed screw heads on the lower hull side covers even includes slot detail. 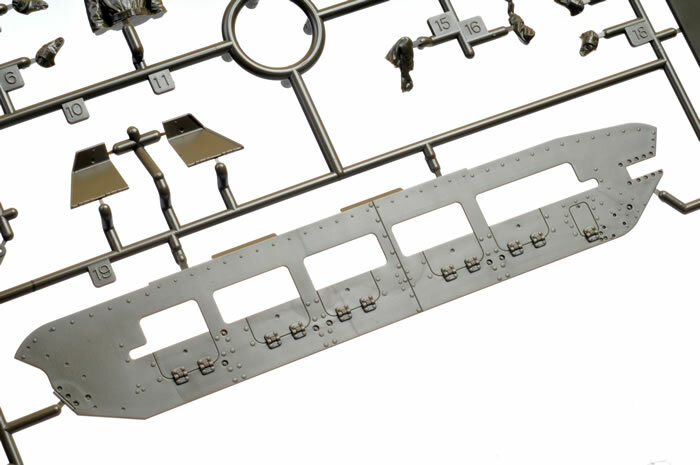 Raised strips, rivets and bolts are present wherever appropriate. The asbestos insulation wrapped around the exhaust pipes looks fantastic too. 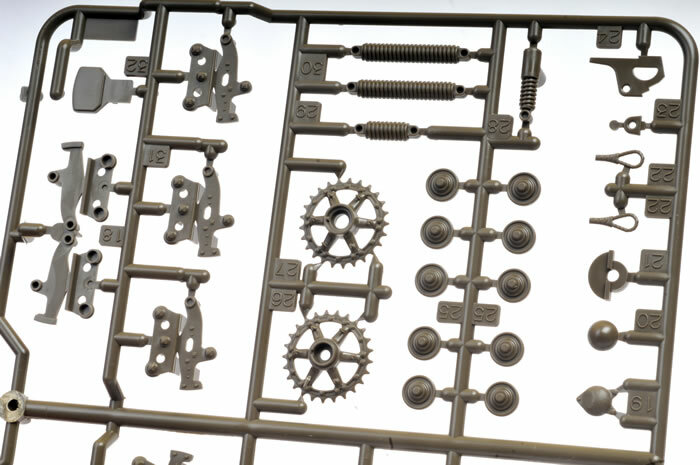 The sprues contain two styles of 2 Pdr gun barrels plus a 3” howitzer barrel, which suggests that a Close Support version is on the way. 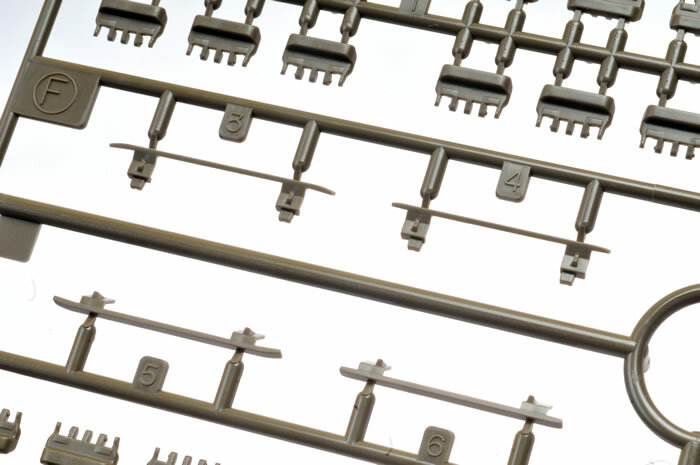 Each barrel is supplied in one piece and is hollow at the muzzle end. Several rows of flashed over holes may be found on the inside of the hull surrounding the turret ring. This hints that the Australian version featuring the armoured ring protecting the base of the turret might be seen some time in the future. 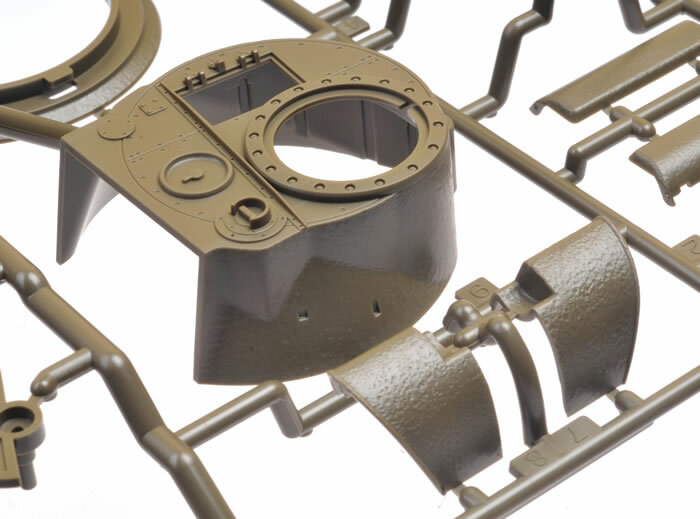 The low-profile Commander’s cupola is included on the sprues too – another feature typically seen on Australian Matildas. The mantlet is secured with poly caps allowing the gun to elevate, and the driver’s hatch may be left to slide on its rails. 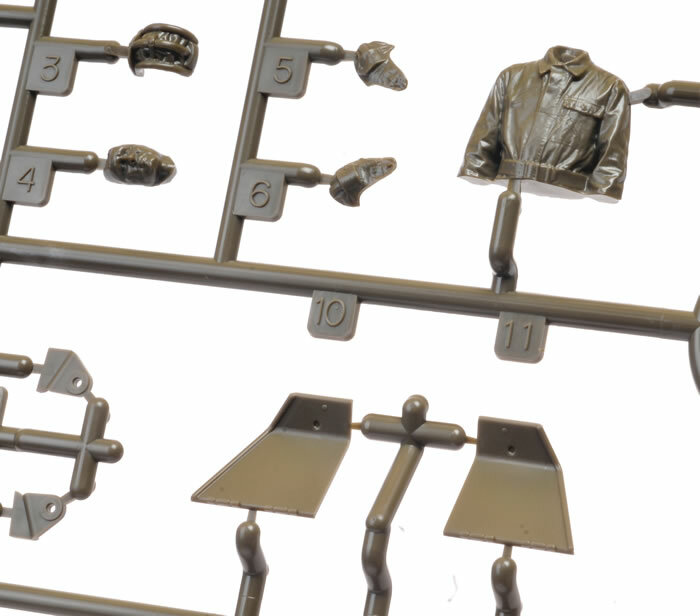 A full compliment of new on-vehicle tools plus crew stowage is supplied. 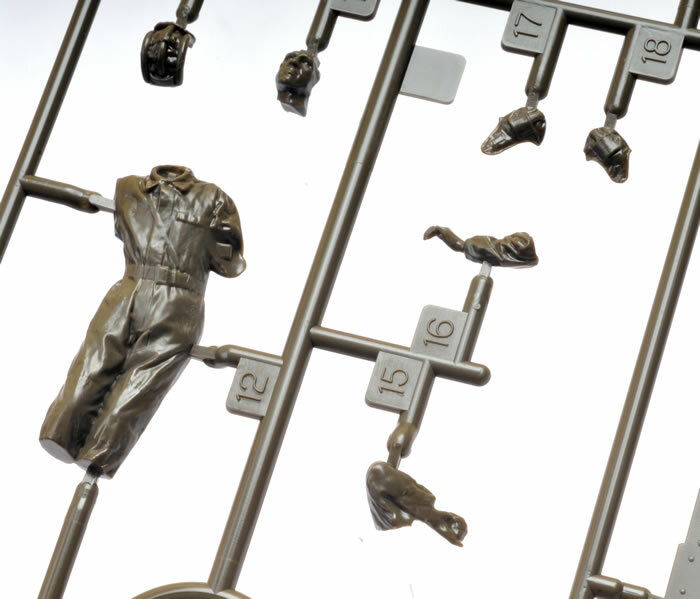 Two Soviet crew figures are included. Poses are relaxed and sculpting is very good. 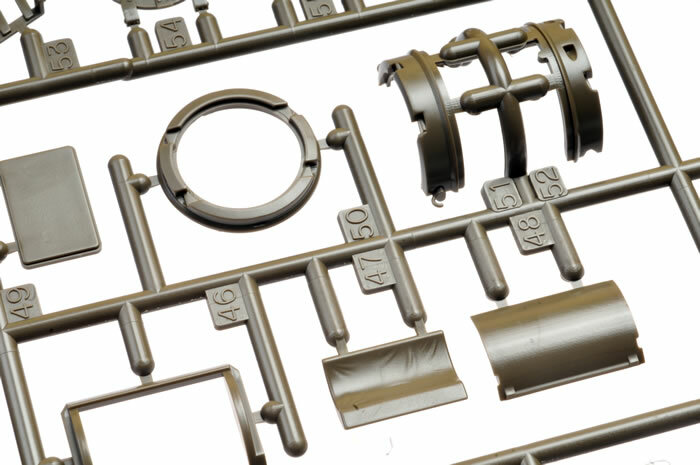 Moulding quality is marvellous. There are just a few very feint circles to clean up on the inside of the loader’s hatch. 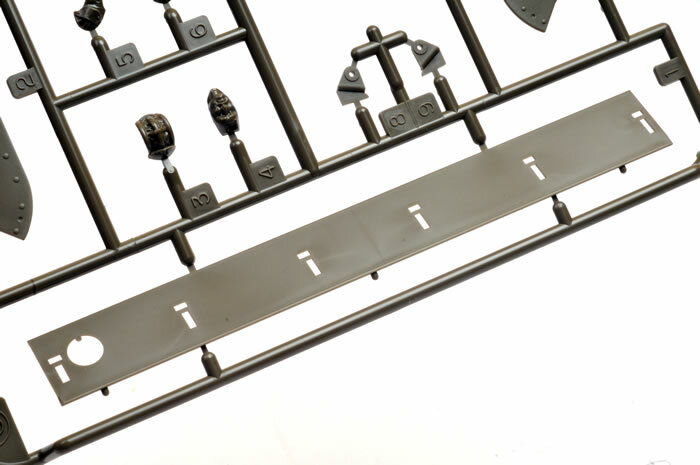 Although there are an alarming number of ejector pin marks on the lower hull, these will all be completely hidden behind suspension components and the big mud chutes. Sponsons are not boxed in but you won’t see the light of day once the armoured hull sides are secured. The searchlight lens is a solid plastic piece. 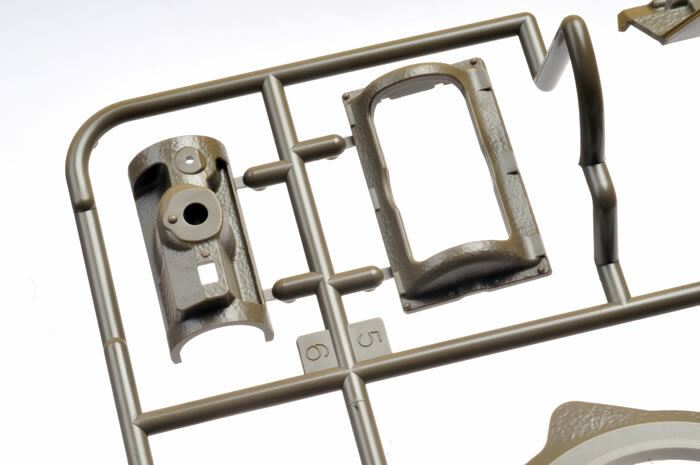 Helpfully, however, it is a separate part so it may be replaced with a clear lens if desired. 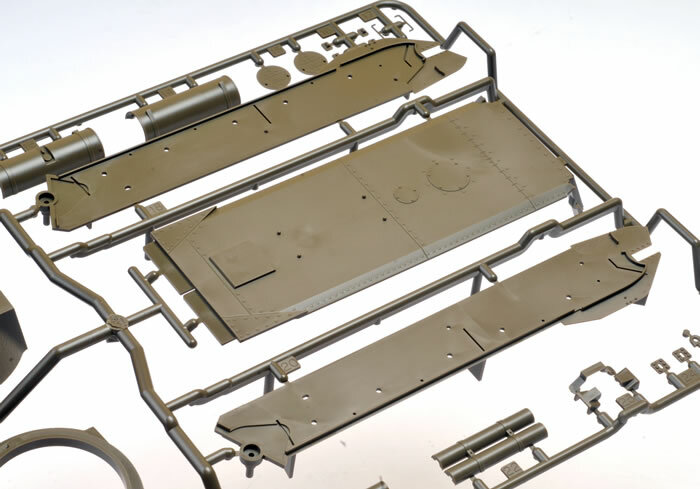 Kit engineering is sensible, and this Matilda should be as straightforward to build as the 2009 kit. 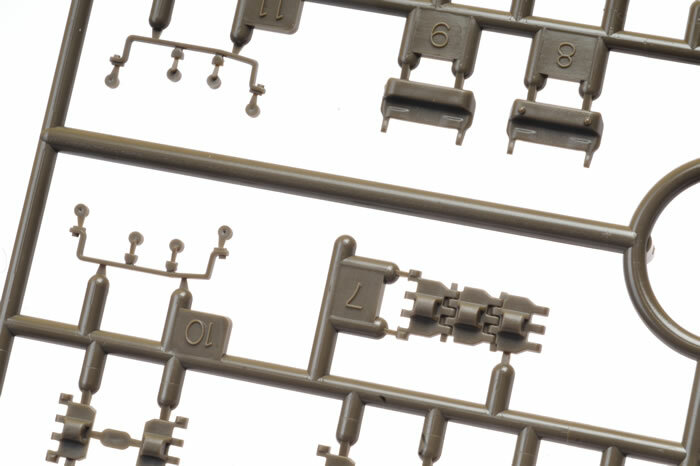 I particularly like the way Tamiya has broken down the nose of the vehicle to avoid a horizontal join across the front of the hull. 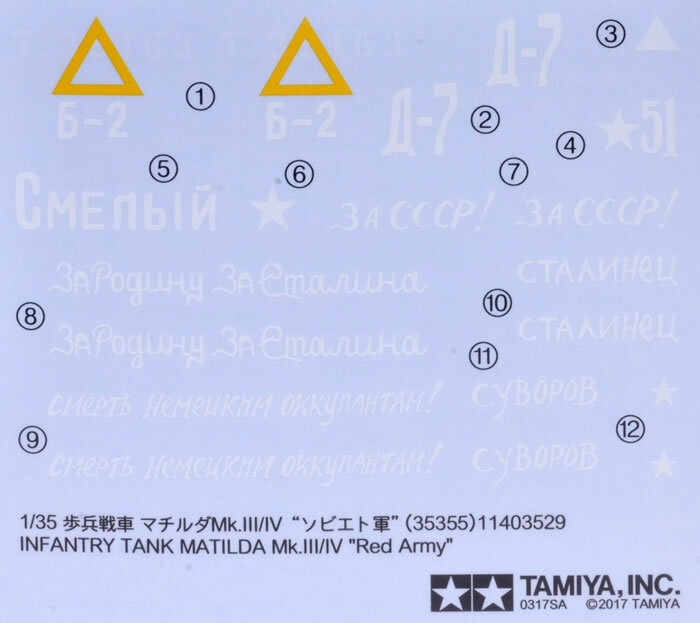 Decals are included for two specific Soviet Matildas in 1942, while decals 3 to 12 are various generic slogans and markings. This one won’t be staying in the box for long!